Polka dots are showing up everywhere this spring! The iconic print feels fresh yet traditional at the same time. Numerous options exist to punch up your spring wardrobe with some spots. Today, I am sharing some of my favorite polka dot options! The cutout back on this sophistcated polka dot midi dress adds a modern flair. I love this traditional button front dress updated with puff sleeves. Who said polka dots must be neutral in color? This darling dress also offers a flirty handkerchief hem. This swingy mini dot dress is perfect for spring/summer with a pair of espadrilles and a straw handbag. A linen and cotton blend dress transitions beautifully to summer. The simple lines of a sheath dress are punctuated with flutter sleeves. A navy poka dot brings an element of fun to a wrap dress. A polka dot t-shirt dress amps up a casual wardrobe. A bi-stretch sheath dress goes easily from workweek to weekend. Jump for joy in this darling dot jumpsuit. A cool, navy and white linen/cotton blouse pairs beautifully with white linen pants or white denim jeans. A drapey tie neck blouse goes to the office or out to dinner. Add some colored dots to your spring wardrobe with a pink polka dot silky top. Try a versatile silky soft shirt to embrace the polka dot trend. The simplicity of this clipped dot blouse is spot on. Flirty ruffles compliment this feminine blouse. Say yes to a darling white tee embroidered with black dots and ruffled sleeves. Keep warm on those cooler spring days with a cashmere dot sweater. If you dare, try on a pair of slim fit dot pants. This chambray trench coat brightens any gloomy day. What an adorable clutch in calf hair with polka dot print. 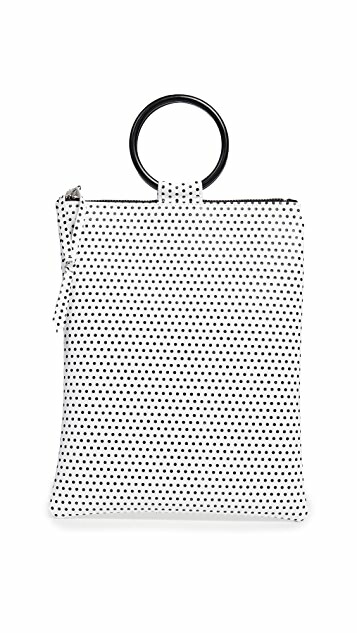 An on trend ring bag adds modernity to the polka dot. 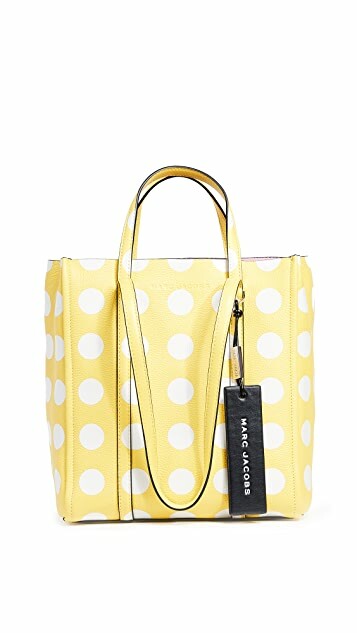 Trendy yellow and dots make for a perfect spring tote. A dot pump completes any black tie dress. I’m loving the idea of these mules with jeans and a simple white t shirt. Slip these sandals on to dress up that black swimsuit and coverup. 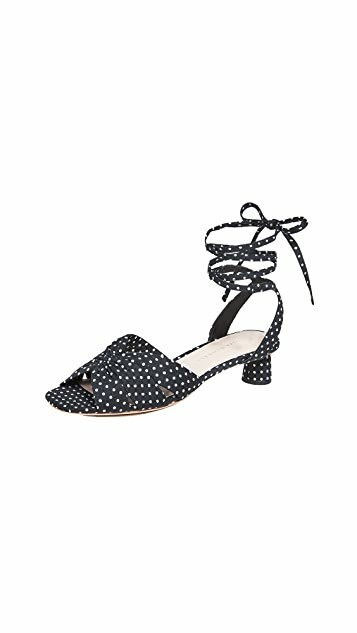 Wear these dot sandals with everything from a little black dress to ankle jeans. Dip your toes into polka dot with a subtle grey and white scarf. Add a touch of whimsy with this black and pink scarf. Clip this scarf accessory to your black handbag for an instant update. Add some pizzazz to your apple watch with a polka dot band. Having a bad hairday? Pull it back with a dot headband. Chase away spring showers with this umbrella. Are you seeing dots now? With all the selections of polka dots offered this spring season, introduce a piece or more into your wardrobe!